When you work from home, your home office is a space you’ll spend a lot of time in, so it’s important that it works for you. Whether you’re just starting out from home, or you need to renovate, you’ll need to make the space your own. Renovating any room in your house can be quite a process, and it’s usually not inexpensive either. Read along for some of our tips for renovation on a budget! Repurpose furniture with a fresh, new coat of paint, or utilize unused items from other rooms. Can that table behind the couch be used as a table for your printer? Take what you have a make it work! You can take a boring chair, add some fabric, and make it new again. A little bit of paint or fabric can make a world of difference. If you have a sofa in your office, add some fresh pillows or a throw. You can also repurpose someone else’s disregarded items – look to antique or garage sales that feature desks, solid furniture, or any other items that can be spruced up with a minimal amount of work. With sites such as Etsy, you can get a lot of artwork in a digital format. You can simply search for art prints that feature inspirational words, photos, art from other countries, and so on. There are truly an endless amount of options! From here, you can print out the piece and have it framed, or purchase an inexpensive frame at a local store like Target or Michael’s. Digital, print-it-yourself art is typically much less expensive, and generally runs from $3-20 per piece on Etsy. Adding just a few prints will likely run you $30-100 total, and it can really change the vibe of the room. Some items will just always be more expensive. A good, solid ergonomic office chair is a great place to spend money! A nice desk is also a place where quality is important, but you can also find good furniture at repurposed places, such as flea markets or garage sales. You can really go “budget” on things such as office supplies. There are plenty of cute options out there that don’t break the bank! 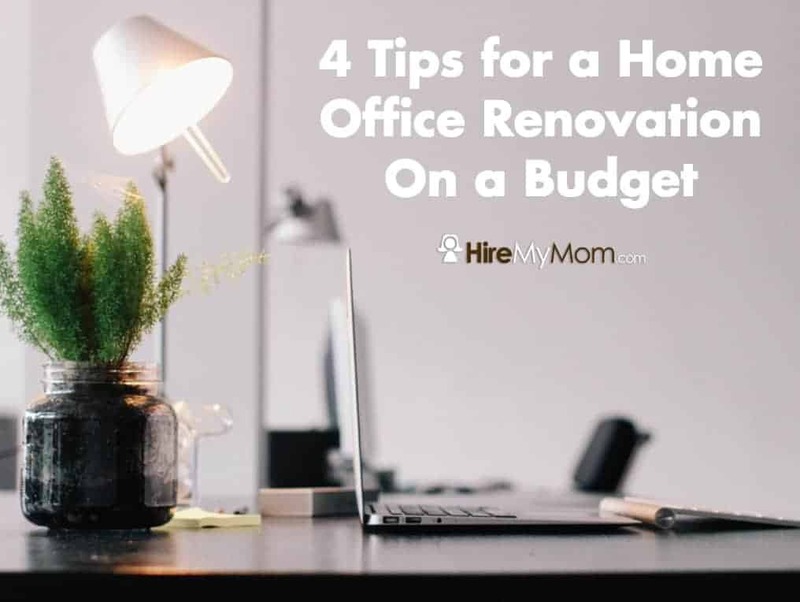 Make a list of all the items needed for your renovation, and jot down where you can save, and where you’ll need to spend a little bit more. Once the major items are decided on, you’ll also have a better overall view of your renovation budget. Start slow! You can start as small as adding a tiny plant – it can literally breathe fresh air into your space. Paint your walls one month and get a new desk the next. If you’re budgeting, earmark a small allowance each month (or every few months) to make the changes. Creating a cozy home office doesn’t have to be expensive! Start slowly, be economical, and spend where you need to. In no time, you’ll have a space that reflects your taste and allows you to work in peace. At HireMyMom we want to help our Mom Professionals succeed at home and in business. We have a supportive community of Mom Professionals as well as great work from home jobs posted by small businesses around the country! Learn more about HireMyMom and how you can join a supportive faith-based community of Mom Professionals!